Running an online museum with people who live in three different European countries is exciting, but also means it’s very easy to forget how different things can be when you’re chatting in real life, in the same room. 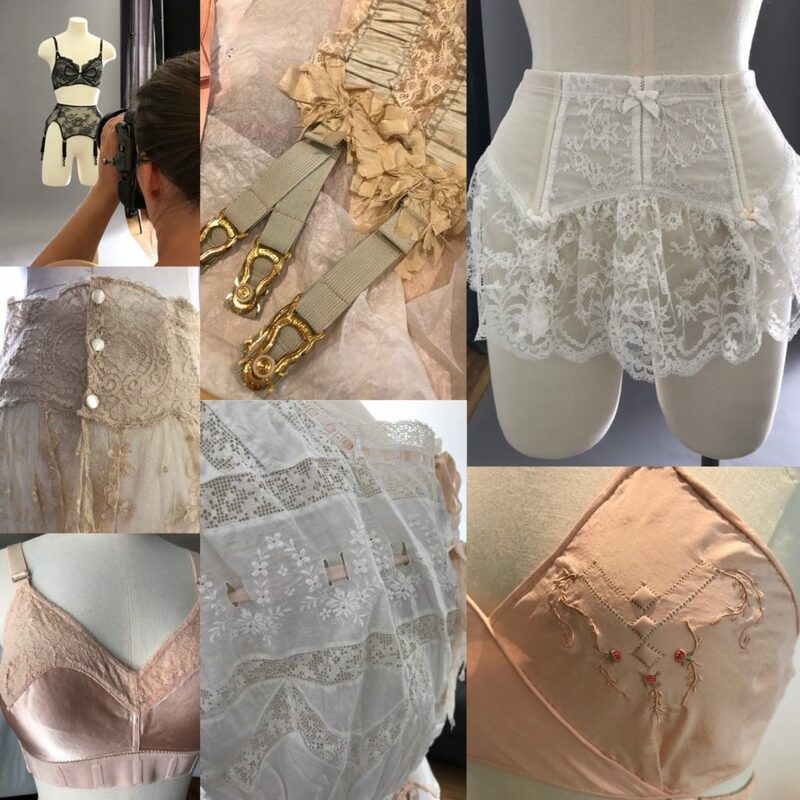 Although I have yet to meet the lovely Liz in person, which is something I hope to be able to rectify soon, on Monday and Tuesday of this week I had the pleasure of helping out at the latest Underpinnings Museum photoshoot with Karolina and Tigz. Yes, three of the team in the same room at the same time! When I arrived at the studio. Karolina had thoughtfully got a mug of tea waiting for me and was already getting started on lacing corsets onto the appropriate mannequins, while Tigz was setting up the lights. Once everything was ready to go, we popped the radio on to keep our energy levels up and started shooting. We have one upcoming exhibition in the works already, but the majority of day one of the shoot focused on recording objects for two planned future exhibitions. One of those is so secret that we won’t be sharing any behind the scenes photos, so as not to spoil the surprise, but I did share a lot of images from the rest of the shoot on my Twitter and Instagram. While Karolina dressed the mannequins and padded garments where appropriate, my main role was lifting the mannequins onto the stands and then turning them for Tigz once she’d got the shots she needed of a particular angle. This might not seem like much, but I was reassured that having me there saved a lot of time compared to previous shoots! We soon got into a rhythm and, once the secret exhibition was all shot, took a short walk in the sunshine to find some lunch. The afternoon flew by and, after a productive day, we were understandably exhausted. Day two started slowly (as our overactive brains and the current temperatures in the UK are not conducive to good sleep! ), but we soon got through a flurry of lovely lace garments and I shared a few behind the scenes photos on my social media accounts. Although Liz (the museum’s social media coordinator) wasn’t around for the shoot, we did do a short live video for Facebook, and Liz shared lots of my tweets to help keep everyone in the loop. By the end of the day we’d named our mannequins, shot labels and garment interiors, pondered the existence of the world’s most impractical boudoir cap, and had even shot the museum’s first items of menswear! We’ve named @TheUPMuseum mannequins. In chronological order of silhouette, they are: Victoria (aka Vicky), Camille (aka Cam), Philomena (aka Phil), and Elizabeth (aka Bettie). Phil is the bane of my life. I’m so glad we’ve finished with her for the day. 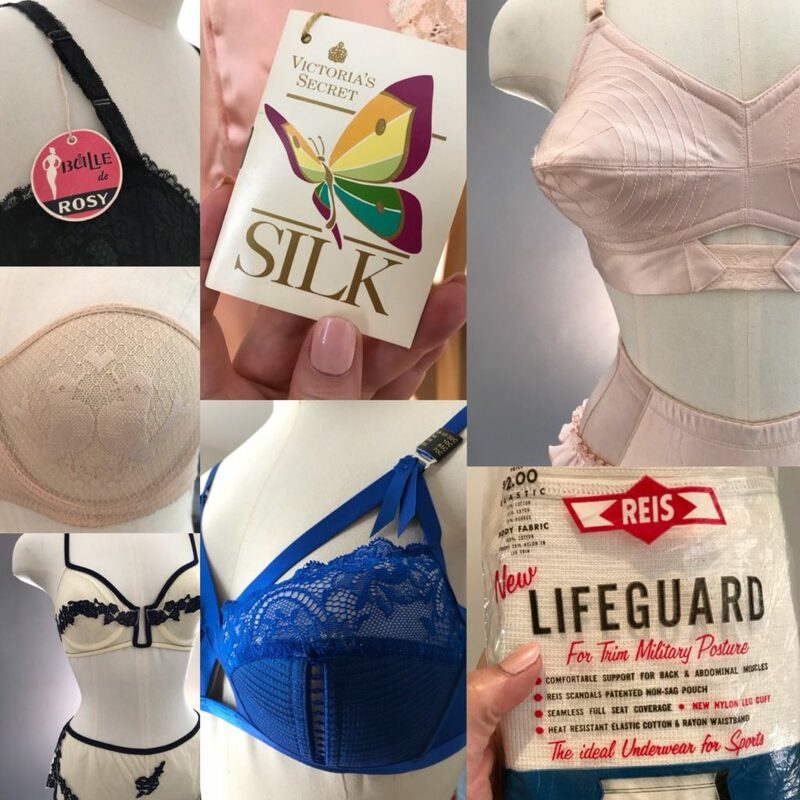 I really enjoyed being a part of the shoot this time, helping to bring even more fascinating items of underpinnings history to a global audience of underwear enthusiasts. Over the two days we recorded around 70 garments for the museum. Next comes photo selection and editing, writing object descriptions, and preparing the item pages on the website, all of which is incredibly time consuming so may take some time. I assure you though, it’ll be worth the wait! Hopefully one day we’ll be able to have a photoshoot or event where the whole team is present but, until then, our team is as ‘virtual’ as the museum. We look forward to sharing the results of this shoot with you over the coming months.